Shop On Stage MY110 Wireless Microphone Clip from AMS and enjoy Fast & Free Shipping. The MY110 wireless rubber microphone clip fits standard microphone stands and firmly holds standard-size microphones. 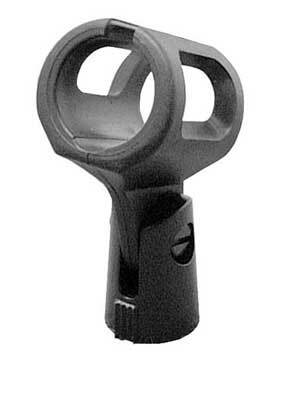 The MY110 is a straight style clip with a 5/8 inch 27 female threaded insert in the plastic base. Work perfecly with Blue Encore mics and better build quality than original. No more stripped threads! It is well made. Nothing wrong with the quality. It did not meet my needs exactly. My wireless microphone might be a little larger than average. Works great with my vocopro wireless mic's.